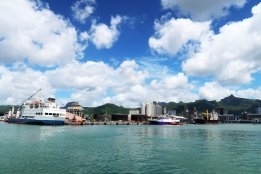 Port Louis, Mauritius. Image Credit: HullWiper. The HullWiper underwater hull cleaning service is now available in Mauritius courtesy of an agreement with underwater hull cleaning specialists Immersub. The service expansion marks the first step into the African continent. Excessive hull fouling has long been understood to increase bunker consumption, but the implications for marine environments from biofouling are gaining increased attention. "As home to some of the world's rarest plants and animals, Mauritius recognises the need to implement measures to stop the growing threat of foreign aquatic species," says Simon Doran, HullWiper's Managing Director. "In line with the Mauritius Port Authority's commitment to sustainable and eco-friendly port activities, it was an obvious choice for our first operational base in East Africa." BIMCO last year warned a recent backlash against underwater hull cleaning risks increasing bunker consumption along with the associated emissions. Deal took place in USGC market. After reports of leakages from dry-disconnect/connect couplings.